Racing teams for the Vanderbilt Cup Races typically had local headquarters to store and work on their racers and also provide lodging. 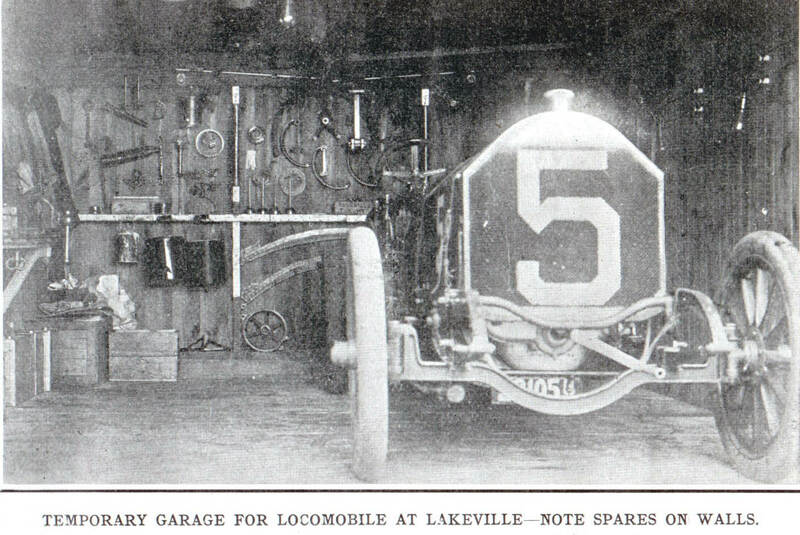 In 1905 and 1906, the Locomobile team from nearby Bridgeport, Connecticut set up their headquarters at Maple Cottage, a farmhouse located in Lakeville (now Lake Success). Dr. Jack Binder, Village Historian of Lake Success, has provided a history of Maple Cottage, a 1905 letter from a family member and vintage photos. Combined with images and articles from my collection, Maple Cottage is the subject of today's VanderbiltCupRaces.com "Then & Now" analysis. 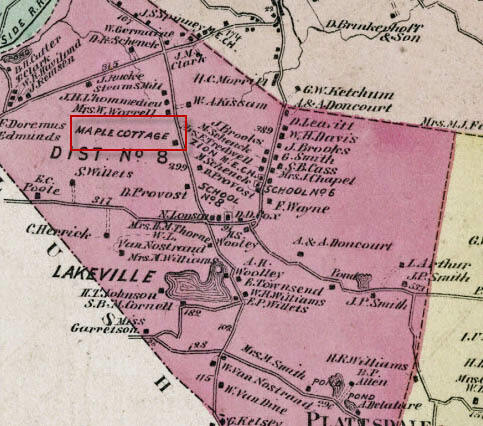 Before there was a Farm Lane in Lake Success, a house was built at the site in 1814 by Sam Warren. It was a one-story farmhouse and was known to house slaves in its basement. Expanded over the years to two stories, the farmhouse came to be decorated in a Victorian manner. 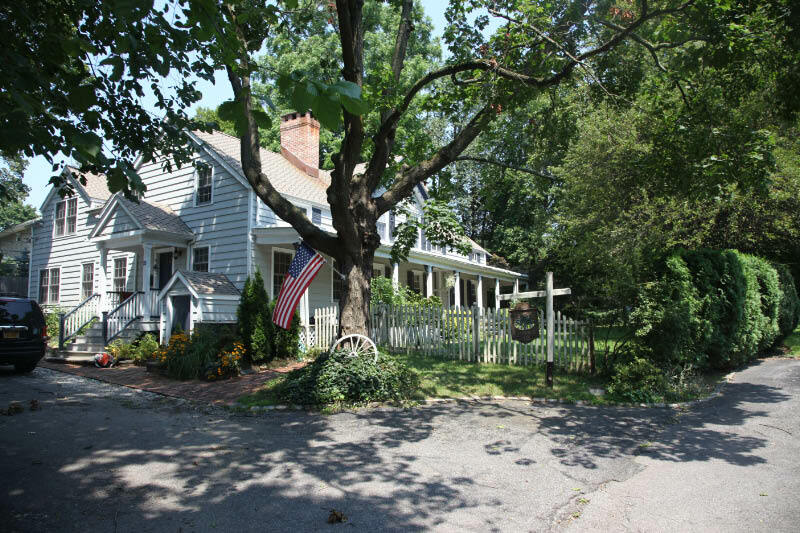 In the 1870s, the Warren farm was purchased by John Dennelly. He had previously lived in Great Neck and owned a landscape business. His company was retained by A.T. Stewart to lay out the model community of Garden City. John and Catherine Dennelly were married in 1877 in Great Neck's St. Aloysius Church. Their wedding was the first in the newly built church. Shortly after the wedding, Dennelly bought the Warren farm and named his new house "Maple Cottage". Over the years, improvements were made to the property. The house was the first in Great Neck to have indoor plumbing and electric lights. 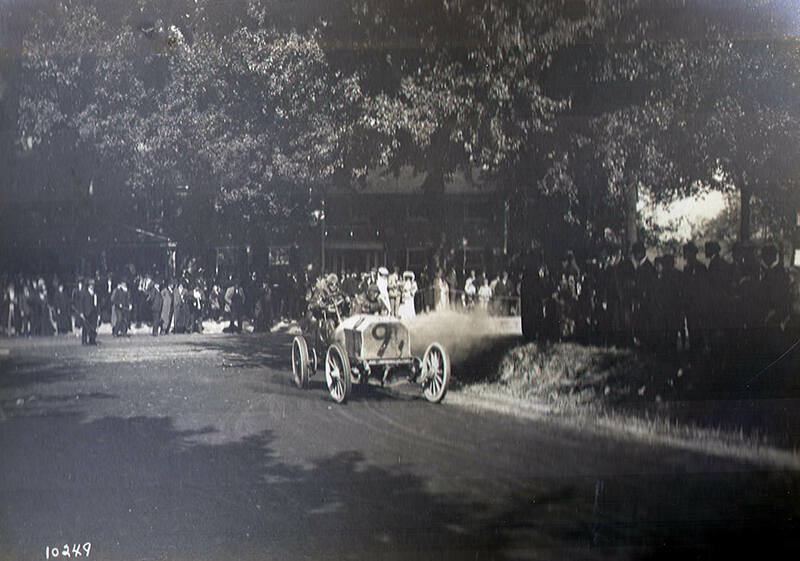 William K. Vanderbilt, Jr., ran the 1905 and 1906 Vanderbilt Cup Races on Nassau County public roads which included Lakeville Road. 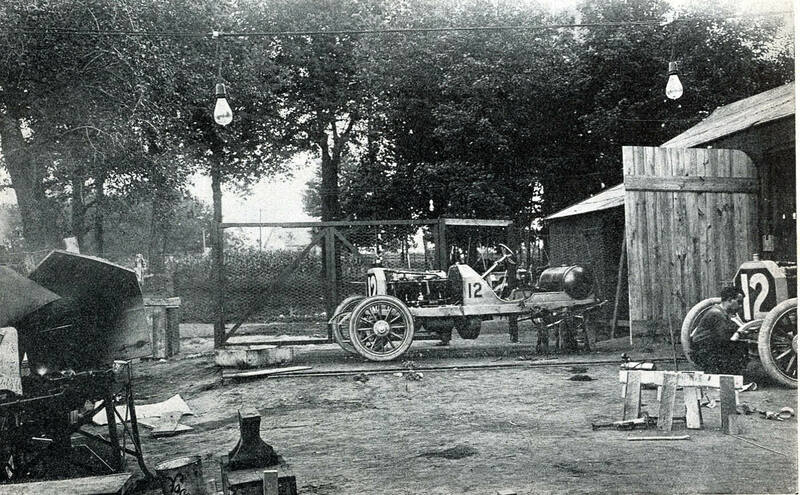 Convenient for the practice runs, the nearby Maple Cottage was headquarters for the Locomobile team including driver Joe Tracy and mechanician Al Poole. Members of the Automobile Club of America also stayed at the cottage. A vantage point to watch the 1905 and 1906 races was the just south of Maple Cottage at the Lakeville Hotel at "Flaherty's Corner". The location today is at the intersection of Lakeville Road and the Long Island Expressway. Up to 1938, the Dennellys gave permission to horseback riders to cross their farm which was part of a hunt trail. Riders were called "Pinks" and wore high hats as part of their uniform. The nearby Rice farm supplied the horses. Besides the main house, the Dennelly Farm had a guest house, carriage house , stable with a tack room and a barn. The caretaker had his own cottage. The 1987 Beers, Comstock & Cline map shows the location of Maple Cottage adjacent Lakeville Road north of Lake Success. For the 1905 American Elimination Trail and Vandebilt Cup Race, the Locomobile Company of Bridgeport l made Maple Cottage their Long Island headquarters for three weeks. The sign reads; "Keep Out- This Means You". The Maple Cottage carriage house was converted into a "temporary garage". 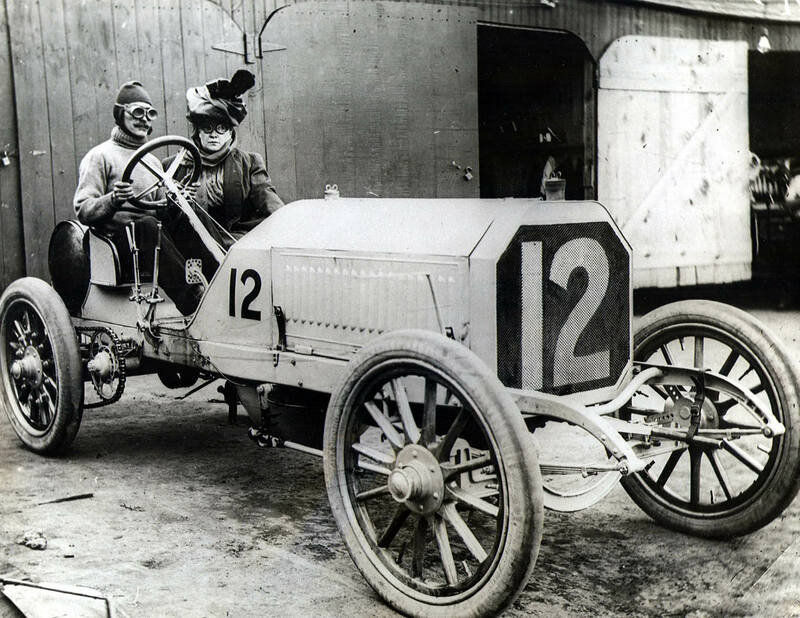 This Locomobile was assigned #5 for the American Elimination Trial to select the five American cars that would compete in the 1905 Vanderbilt Cup Race. Driver Joe Tracy can be seen here second from the right. After qualifying by finishing second, the Locomobile finished third in the Vanderbilt Cup Race running as #7. 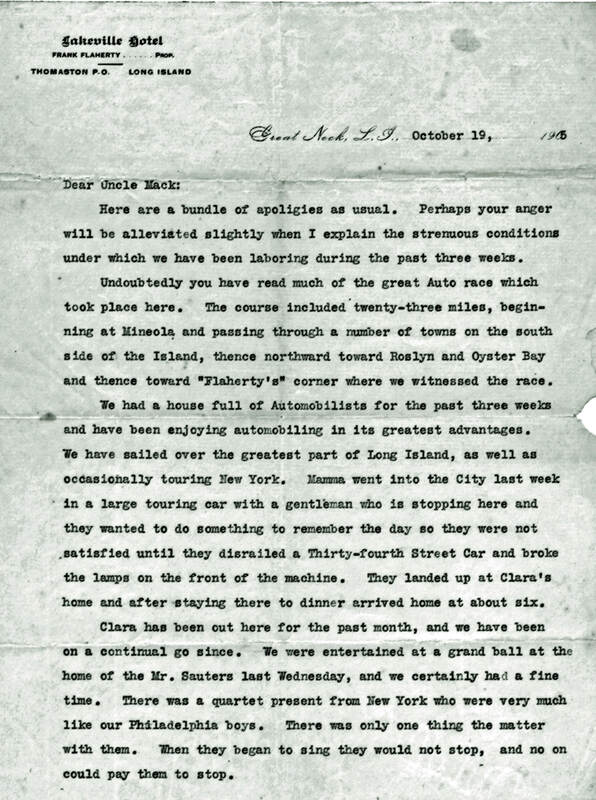 On October 19, 1905, Agnes Irene, a member of the Dennelly family, wrote to her Uncle Max describing the excitement in Maple Cottage during the Vanderbilt Cup Races. The letter was written on "borrowed stationery" from the nearby Lakeville Hotel. 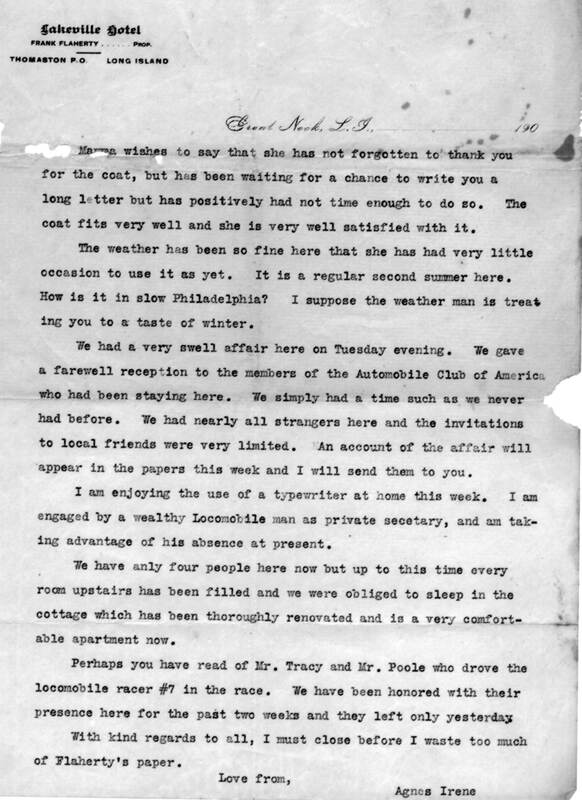 This letter was a gift of Betty Wesstrom, a granddaughter of John and Catherine Dennelly and is courtesy of Dr. Jack Binder, Village Historian of Lake Success. "Undoubtedly you have read much of the great Auto race which took place here. The course included twenty-three miles, beginning at Mineola and passing through a number of towns on the south side of the Island, thence northward toward Roslyn and Oyster Bay and thence toward "Flaherty's" corner where we witnessed the race. We had a house full of Automobilists for the past three weeks and have been enjoying automobiling in its greatest advantages." "We had a very swell affair here on Tuesday evening. We gave a farewell reception to the members of the Automobile Club of America who had been staying here. We simply had a time such as we never had before. 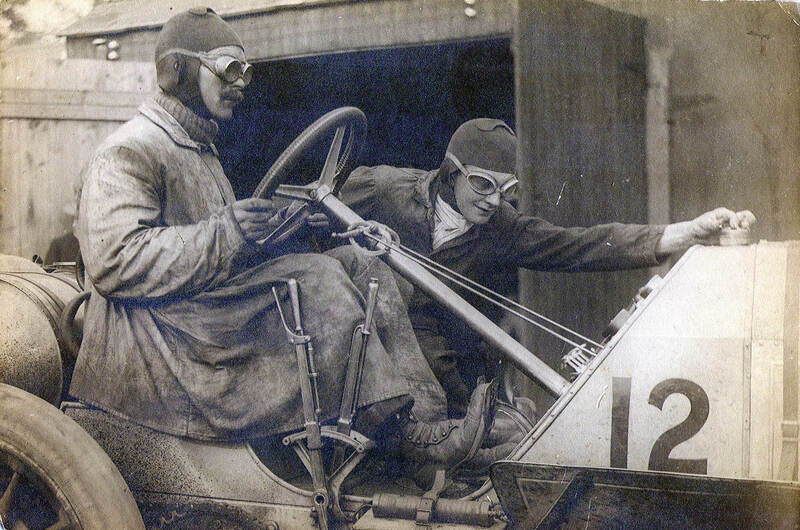 Perhaps you have read of Mr. Tracy and Mr. Poole who drove locomobile racer #7 in the race. We have been honored with their presence here for the past two weeks and they left only yesterday." Link to a PDF of the Agnes Irene 1905 letter. Download may take a minute. 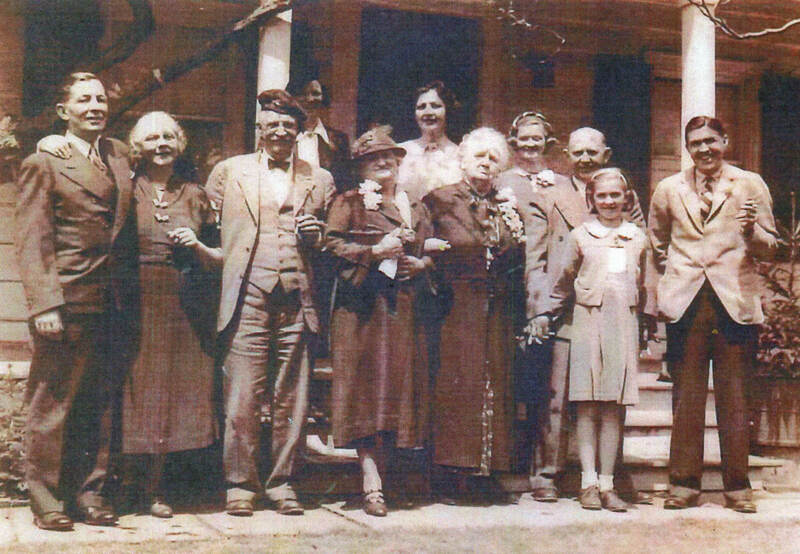 Agnes Irene and members of the Dennelly family were likely in this photo shot in front of Frank Flaherty's Lakeville Hotel. 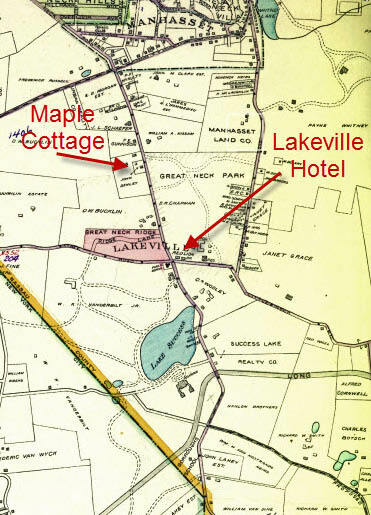 This 1914 Belcher-Hyde map shows the relative locations of the Maple Cottage and the Lakeville Hotel. 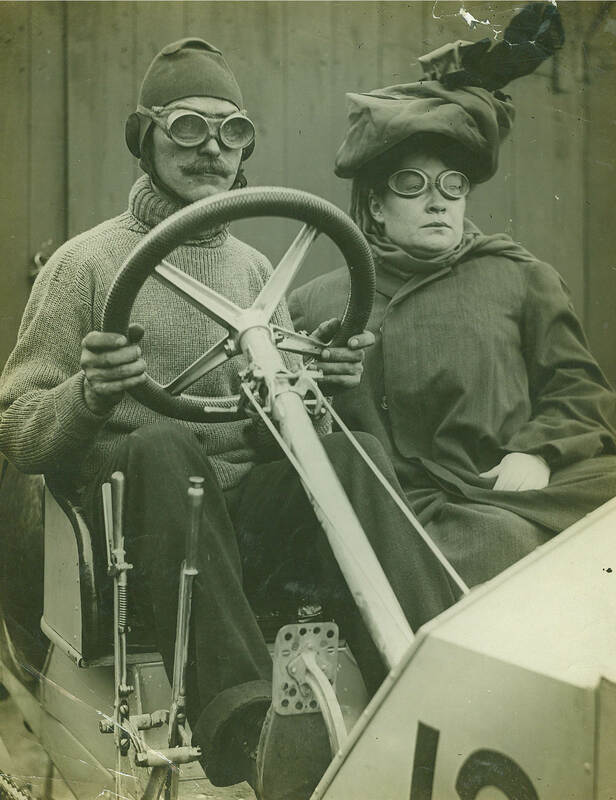 The Locomobile team returned to Maple Cottage for the 1906 Vanderbilt Cup Races. 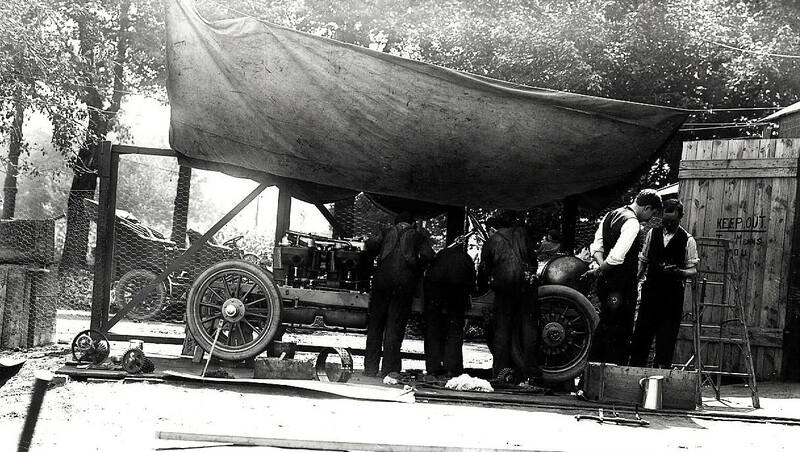 The #12 Locomobile and its backup racer were being prepared in front of the Maple Cottage carriage house. A great photo of driver Joe Tracy and his mechanician Al Poole. Several celebrities took the ride from the Great Neck railroad depot to see the Locomobile's headquarters including prominent Hearst journalist Ada Patterson. Ada Patterson (1867-1939) was considered America's foremost newspaper woman of her day. She was one of the original “sob sister” reporters known for investigative exposes that led to reform of public institutions. Joe Tracy and Al Poole in the Locomobile can be seen at the 1:30 mark of this film. 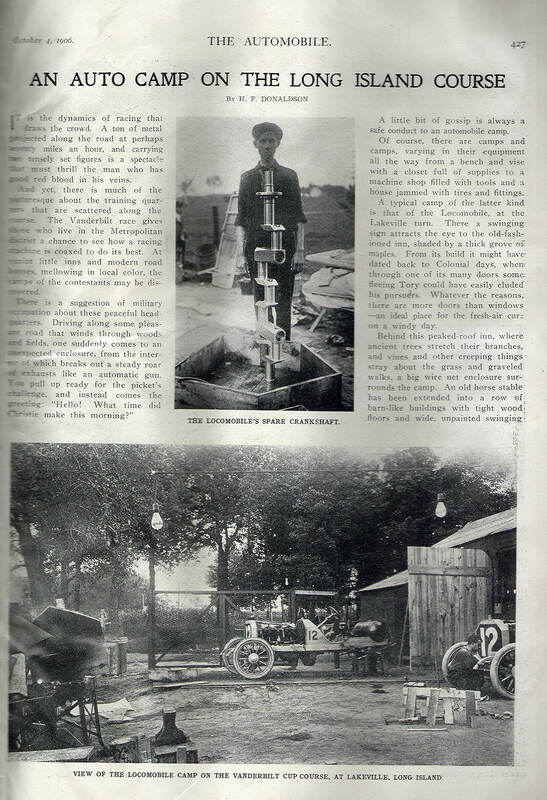 1906 "The Automobile" Article "An Auto Camp on the Long Island Course"
The October 4, 1906 issue of "The Automobile" described the Locomobile headquarters at Maple Cottage. "It is the dynamics of racing that draws the crowd. A ton of metal projected along the road at perhaps seventy miles an hours, and carrying two tensely figures is a spectacle that must thrill the man who has good red blood in his veins." And yet, there is much of the picturesque about the training quarters that are scattered along the course". "A typical camp of the latter kind is that of the Locomobile, at the Lakeville turn. There a swinging sign attracts the eye to the old-fashioned inn, shaded by a thick grove of maples. From its build it might have dated back to Colonial days, when through one of its many doors some fleeing Tories could have easily eluded his pursuers. Behind this peaked-roof inn, where ancient trees stretch their branches, and vines and other creeping things stray about the grass and graveled walks, a big wire net enclosure surrounds the camp. An old horse stable has been extended into a row of barn-like buildings with tight wood floors and wide, unpainted swinging doors, that house the two big racing cars and enough machine tools and spares to start a model factory." Link to a PDF of "The Automobile" 1906 Article. Download may take a minute. The Dennelly family in front of Maple Cottage. 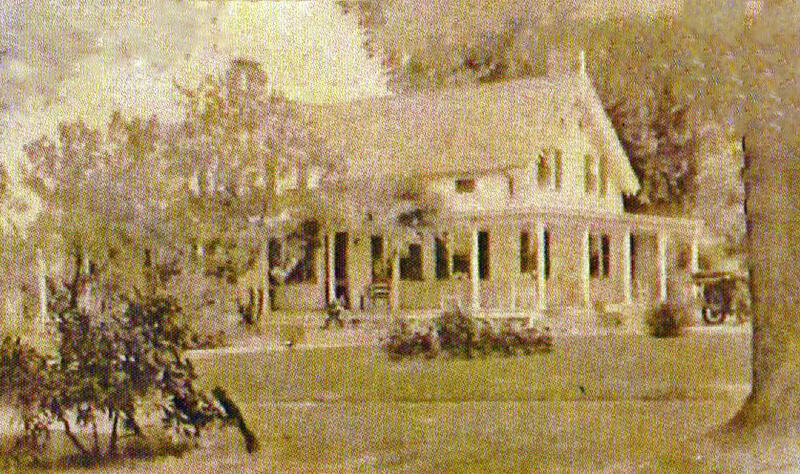 Maple Cottage around 1910. Courtesy of Dr. Jack Binder. I’m stumped as to the actual location now though…is it accessible? Visitable? Maple Cottage is now a private residence. It can be seen at the very end of Farm Lane in Lake Success and even behind some trees on Lakeville Avenue. 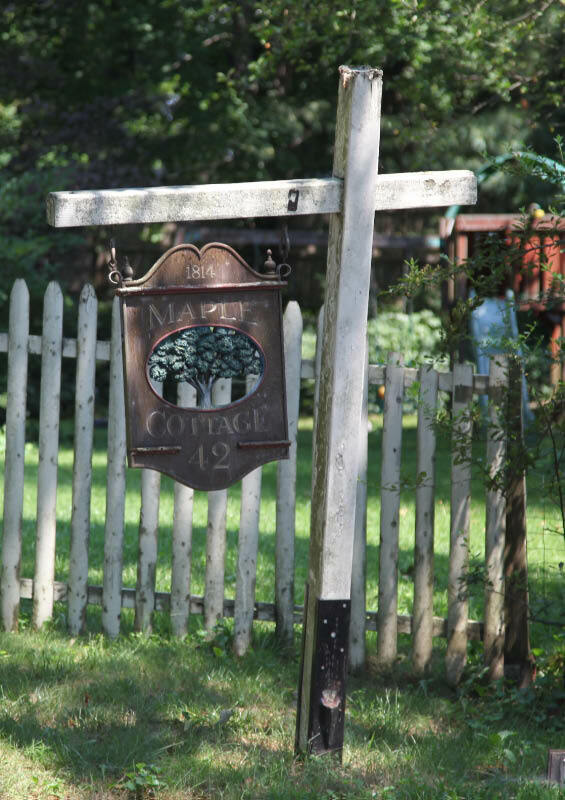 “Wonderful piece on Maple Cottage, Howard. Well done - great photos! Wonder if Ms Ada was Nat. Wood in the Tony Curtis film? Checked it out tonight literally across from the entrance of the Fresh Meadows country Club where I worked for years as a teenager. Thanks Howard! “Good morning, Howard…Just enjoyed your Maple Cottage piece and, perhaps, made a discovery. Any way of learning whether Ada Patterson might have married a Phillip Myers (spl?) later in life? In your photo caption, the Patterson name jumped out at me and, as a 7 or 8-year old, I remember an “Aunt Ada” who was great friends with my real Aunt Ella Patterson and who lived in Mineola with her husband, “Uncle Phil”. This was a real brain exerciser over 75 years after the fact, Howard, so if nothing comes of it I’ve still enjoyed the search. Any way to find out whether she’s one and the same? Might make a future fun story for you. Elizabeth Vanderwall Wesstrom youngest grandchild of the Dennelley’s daughter of Ethel Nora Vanderwall. So thrilled to see the history go on for others! We have Jack Binder to thank for this as well. Elizabeth, thanks for commenting on your family’s home! My grandmother was Jane Denellelly one of the children of John and Katherine Dennelley who married Michael J. Ryan, Boston Marathon winner in 1912 and Olympic track coach and participant in the 1920s through 1940s . So happy to read about my family history. So glad to read about this very interesting piece of my family history! I am the great granddaughter of John and Katherine Dennelley through their daughter, my paternal grandmother, Grace Cecile Dennelley. Grace was one of many sisters (13 children) in the Dennelley family. So glad to read of another distant relative here and to know that my grandmother had a sister named Jane.